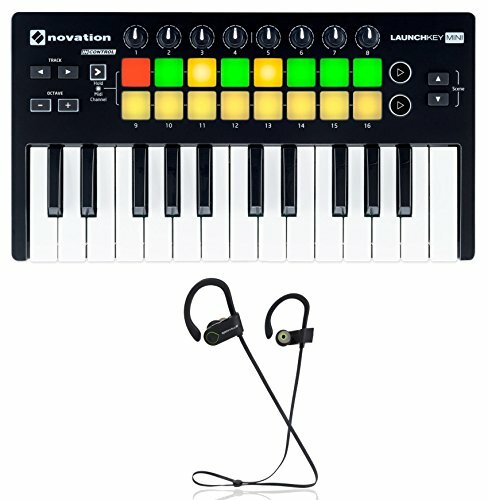 Features: Novation LAUNCHKEY MINI MK2 25 Key USB Ableton Live Lite Keyboard Controller . Windows 8.1, Windows 8, Windows 7. iOS 8, iOS 7 - Camera Connection Kit or Lightning to USB Camera Adapter required (not included). Software included upon registration:. Ableton Live Lite music making software. 4 GB of Loopmasters sounds and samples. Bass Station VST and AU plug-in synthesiser. V Station VST and AU plug-in synthesiser . All Novation products come with 4 GB of Loopmasters Samples. Available for new and existing customers, the Addictive Keys virtual instrument from XLN Audio is on the house when you register your controller keyboard. One full license per account gives you one Addictive Keys instrument. Pick from Modern Upright, Studio Grand, Electric Grand or Mark One. Rockville RockSport Running/Sports Bluetooth Earbuds Earphones, IPX7 Waterproof Rating. Bluetooth 4.1: Features the latest Bluetooth 4.1 + CVC6.0 noise cancelling technology. These earbuds are perfect for music, and even taking phone calls hands-free. They have a long Bluetooth range of 33 feet. Crazy Long Battery Life: The RockSport headphones have a fast recharging time of 2 hours with a playback time of 8 hours on a single charge. . Multi-Point/Two Devices Connection: You can connect 2 phones simultaneously. Automatically pairs to your phone after pairing the first time. . Skype Compatible: Use these for your Skype calls, with the built in microphone for clear conversations. . . Specifications: Frequency: 2.4-2.483 GHz. Bluetooth Range: 33 ft. Bluetooth Profiles: HFP1.6, HSP1.2, AVRCP1.4, A2DP1.2. Bluetooth Version: v4.1+ERD. Chip: CSR 8635. IPX7 Waterproof Rating. Battery Capacity: Lithium-ion polymer 110mAh. Battery Life: 8 hours. Charging Time: 1-2 hours. Talk Time: Up to 8 hours. Playing Time: Up to 8 hours. Standby Time: Up to 220 hours. Product Weight: 18.5g. Novation LAUNCHKEY MINI MK2 25 Key USB Ableton Live Lite Keyboard Controller . Designed for Ableton Live- All the controls are laid out intuitively and work immediately. Trigger clips and play drums using 16 velocity-sensitive multi-colored pads. Tweak your instruments and effects or freely re-assign using eight high-quality knobs. 25-note velocity-sensitive mini keyboard, with fast synth-style action. Compact and tough enough to throw in your bag. No power cable needed. Get automatic hands-on control of other DAWs, including FL Studio. USB bus-powered and totally class-compliant, so it works straight away without any drivers. Includes Ableton Live Lite, Novation Bass Station and V Station virtual instruments plus 4 GB of Loopmasters samples. Dimensions: 3.07" x 14.96" x 8.66" (H x W x D). Unit Weight: 2.38lbs. System Requirements:. Mac OS X 10.10 Yosemite, Mac OS X 10.9 Mavericks. Rockville RockSport Running/Sports Bluetooth Earbuds Earphones, IPX7 Waterproof Rating. Rockville Engineering: These have incredible bass, mids and highs. We tuned these to sound good for any music type from hip hop, to rock, or even classic. The frequency curve is very flat with the bass slightly boosted. You can expect no noticeable distortion even at high volume. . Secure Fit With Flexible Ear Loops: Our secure fit ear buds stay in your ear comfortably even when running, lifting weights, or doing other activities. Flexible silicone ear loops provides superior comfort. IPX7 100% Waterproof for Sports: An IPX7 rating means these are waterproof and able to be completely submerged in water. They are weather-proof, dust-proof, and dirt-proof making them perfect for running, the gym, jogging, hiking, cycling, the pool, and more! View More In MIDI Controllers.